In typical "me" fashion, with Easter less than two weeks away (this didn't hit me until last Saturday...don't ask) and End of Quarter in full swing at work, I've been trying to decide what color to paint my dining room. It's currently Benjamin Moore HC-50 Georgian Brick which has been a great color for the last 9 years but it's feeling a little dark and far more formal than my current taste and style. Hardwood floors stained "old house brown"
Making my "very traditional" dining space feel more "farm girl french" with nothing more than vision, a little paint, a lot of hard work and a couple of trips to the Good Will. 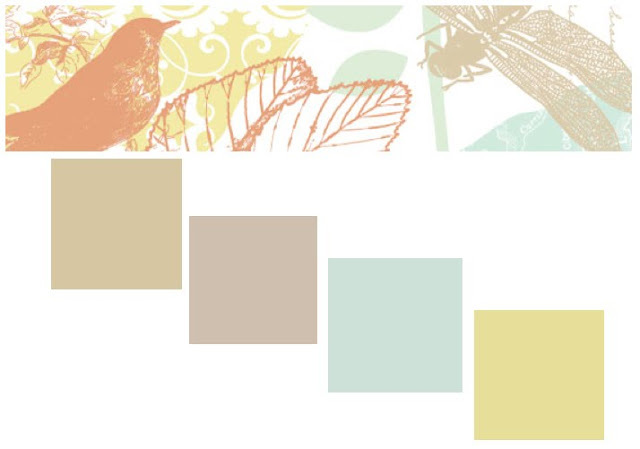 Sherwin Williams: Whole Wheat, Sand Dune, Break Time and Chartreuse with Coral as an accent. After all, coral is in the same "family" as the 2012 Pantone Color of the Year so, why not!? I hope that I'll have some "after" pix for you next week. In the mean time, I hope that you're enjoying Spring as much as I am. Don't you just love white tulips!? I do.